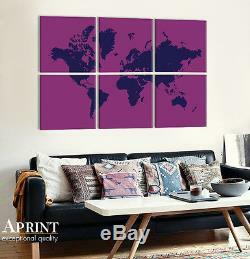 Modern World wall map canvas - Six panel canvas - Custom colours - Large home decor - Ready to hang on the wall. Unique and outstanding wall decor for your home or office. With custom design it will fit in your interior design perfectly! Wall art on high quality cotton canvas. Many sizes and colors avaliable. Choose one color or different for every canvas part! One panel size: 27.5" x 27.5" (70 x 70 cm). Total Size: 55" x 82" (140 x 210 cm). One panel size: 19.5" x 19.5" (50 x 50 cm). 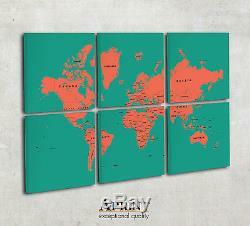 Total Size: 39" x 59" (100 x 150 cm). One panel size: 12" x 12" (30 x 30 cm). Total Size: 24" x 35" (60 x 90 cm). You can hang it on the wall straight out of the box! Fine art quality 350g poly-cotton canvas with matte surface. Gallery wrapped on 1.2/ 3 cm thick wood frame. Coated with special lacquer that ensures extra protection against fingerprints and sunlight. Hangers and dowels included so you can hang it on wall straight out of the box. Archival inks, that will last up to 80 years indoors. Custom Orders - every product we offer can be customized. Made in different sizes, colors or design variations. "Made by professional Fine Art Print printers". Our products are made to order and Ships from Europe Worldwide. This map is available in various sizes as Framed Canvas or Fine Art Print. 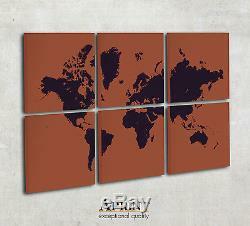 The item "Modern World wall map canvas Custom colours 6 Panel Canvas Ready to hang" is in sale since Friday, February 5, 2016. This item is in the category "Home & Garden\Home Décor\Posters & Prints". 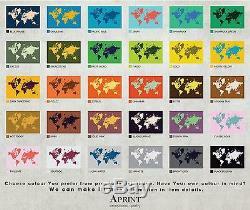 The seller is "aprint" and is located in Riga, default. This item can be shipped to United States, all countries in Europe, Canada, China, Australia.